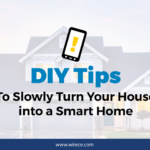 Many of us fall into the trap of watching home improvement shows on HGTV or the DIY Network and thinking that we have the skills to tackle our home improvement projects. While we may be able to handle some things, like painting or tearing out a wall (that’s an excellent way to blow off some steam, wouldn’t you agree? ), there’s one part of your home that you should always call a professional for, and that would be for electrical work. Trying to do DIY electrical work can be incredibly dangerous, and even have devastating consequences. We’ve rounded up ten reasons why you should always call a professional electrician when it comes to electrical work. An overloaded circuit, faulty connections, the wrong gauge of wire used (and more) are all common DIY electrical mistakes that can lead to overheating, sparks, and worse: a house fire. We can all recover from hitting our thumbs with a hammer, but working with electricity doesn’t always give you the same chance for recovery. Touching the wrong wires together or not making sure the current is off can have potentially fatal results. Without a full understanding, your work might not meet code. If you are making improvements to put your house on the market, you might be facing big costs for repairing shoddy electrical work. It’s best just to start with a professional to avoid any costly mistakes from the get go. Most communities require a building permit for significant electrical work. If you don’t obtain a building permit to ensure the work is done correctly, you could be putting you and your family at risk. Even if you manage to survive the process and not start a fire, if you don’t do the wiring properly, it can fail. You’ll be required to hire a professional anyway, so you might as well put your DIY money towards a professional at the beginning. If you put an outlet outside, it needs a ground-fault interrupter button that will trip the outlet if there’s any water. Many DIYers don’t know this, and this mistake can be destructive and dangerous. Even the seemingly simple task of changing an outlet or light switch can go wrong. A loose outlet means wires can move around, which can lead to arcing and overheating. 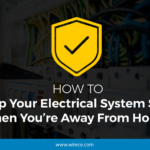 If you’re not a professional, you might not be aware of the proper type of wires, types of outlets, or switches that should be used in certain situations. Using the wrong product can cause big problems. When it comes to your home’s electrical work, your best bet is to hire a professional the first time around, to avoid any of these costly and dangerous mistakes. Do you have any stories of times you’ve tried to be the professional electrician? We’d love to hear them, so be sure to leave a comment. For electrical work in the Seattle area, contact WireCraft Electric to complete your job safely and correctly – we’re here to help.